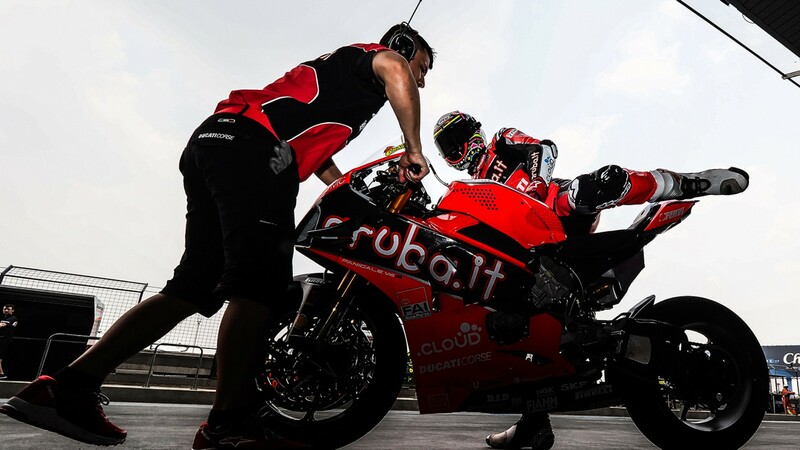 The ARUBA.IT Racing – Ducati riders of Alvaro Bautista and Chaz Davies are taking part in a short two-day test at the MotorLand Aragon circuit ahead of the Aragon Round of the 2019 MOTUL FIM Superbike World Championship. The riders will compete on identical V4 Rs to what they race with for the Ducati Test Team, to gain crucial advantages in the first European round of the season. The test will commence on the 21st March and conclude on the 22nd March, with limited time to make important gains. Alvaro Bautista goes to his home venue for the first time on a production-based machine, looking to find a setting ahead of the round to put him another step in front of the opposition. The 34-year-old has taken the WorldSBK field by storm in 2019, winning six times from the first six races, an achievement that the same Ducati rider has not achieved since Neil Hodgson in 2003. Chaz Davies is somewhat of a MotorLand Aragon specialist, although he has had a troubled start to his 2019 championship charge, failing to adapt to the brand-new Ducati Panigale V4 R as seamlessly as his Rookie teammate. Davies’ record at Aragon has him down in record books as the most successful rider at the track, with seven wins, including two doubles across two manufacturers. Aragon has been a much-anticipated round on the WorldSBK calendar since 2011, having hosted 16 races and seen numerous battles between a variety of rivalries. One of the most dramatic tracks on the calendar, it also one of the most technically demanding for rider and machine. Having a good base-setting at the track is vital for success. Follow everything from the Aragon Round from the 5th – 7th April with the WorldSBK VideoPass!